British Conservative politician and three times Prime Minister (1923-24, 1924-29 and 1935-37). Photograph Signed. The portrait shows Stanley Baldwin half-length, directly facing the camera with confident, steady gaze. The portrait by Vandyk Studios is a real photo post-card by Beagles, signed boldly across the foot of the image. Approx 5.5 x 3.5 inches. Fine. A pleasing image. 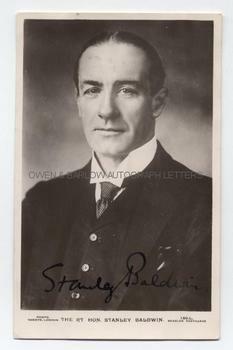 Stanley Baldwin dominated British politics between the wars. His governments saw the abdication crisis of Edward VIII the crisis over Hitler's occupation of the Rhineland, the outbreak of the Spanish Civil War and the depression and high unemployment of the 1930s. He was, however, a popular Prime Minister and he defeated Ramsay Macdonald in two general elections before being ousted by Neville Chamberlain who, like Baldwin, will be remembered for his policy of appeasement.